Cigar Box Battle and Osprey Publishing are proud to bring another "Across A Deadly Field" scenario to your table-top - the Battle of New Market 1864,... will "Put the Boys in!" This is the artwork from the "Across A Deadly Field - the War in the East" Osprey scenario book. The original artwork was designed by Dean West and Todd Davis for the scenario "Put the Boys In! - The Shenandoah Valley, May 1864". This is the scenario mat for the classic battle between Gen. Franz Sigel and Gen. John Breckenridge with the VMI cadets. The large scale 25mm - 28mm version (#143B), plays well with 25mm figures using "Across A Deadly Field" at 1 inch = 60-80 yards. It would also work well for 15mm Johnny Reb, Regimental Fire and Fury, and many other regimental ACW rules. The 25mm mat comes printed on a full sized mat (4x6 plus). 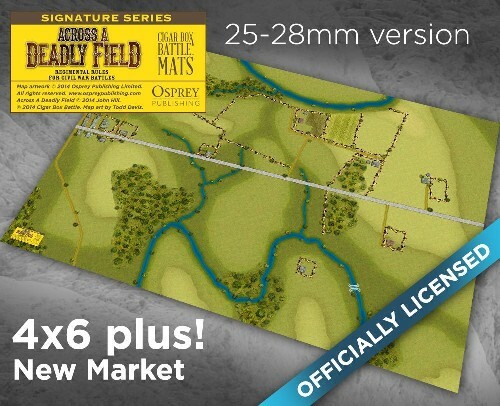 As with all of our licensed Opsrey Publishing mats, these ADF mats come printed with roads, buildings, streams, etc. All you have to do is add the figures (and hills if you like) and play!